Ultra-costly F-35 ‘at least shinier’ than old Sopwith Camel, officials say. WASHINGTON — The Pentagon announced today that a new Lockheed Martin F-35 Joint Strike Fighter had lost over a dozen dogfights to a 1917 Sopwith Camel biplane. 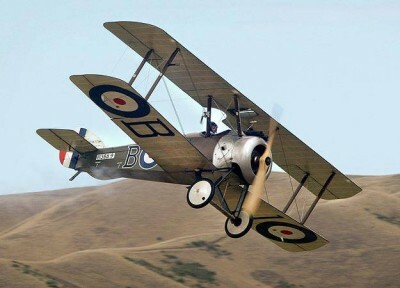 The June 18th engagements showed the World War I-era Sopwith Camel exhibited “superior maneuverability and fighting aptitude” compared to its F-35 opponent. “We are learning a lot about the F-35, and all of our learning experiences are showing us it is an excellent example of what happens when you try to make a plane do everything,” stated Secretary of Defense Ashton B. Carter. Lockheed Martin was quick to defend the costly and frequently delayed F-35 program, which is expected to cost American taxpayers approximately $1.5 trillion over its fifty year life-expectancy. “The F-35 will never meet the Sopwith Camel biplane in actual combat since it was retired in 1920,” stated Lockheed Martin Chairman, President and CEO Marillyn A. Hewson. Alexander Vosh has lived in Rhode Island for all of his life, but is often asked where he grew up by other Rhode Islanders due to his lack of the state's R-optional accent - which will make an appearance on occasion, usually when Vosh is annoyed. Vosh is also highly allergic to right-wing politics, and thinks whisky is swell. He writes regularly for The Nil Admirari, where this story first appeared.